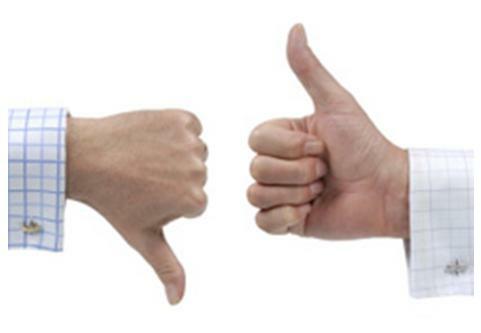 Terms like knockoff, copy and clone are often used to describe electronic cigarette products that imitate the leading and trend-setting designs in the industry. There is usually a negative connotation associated with such derivative designs, but perhaps there shouldn’t be. Blatant copying or mirepresentation is one thing, but the evolution of technology is another, and the latter is often good for the consumer. Enter the variable voltage Smoktech VMax electronic cigarette from Goodejuice. While the device is not a clone of the Provari, it would be unfair not to acknowledge the obvious and intended similarities to that device. There are simply too many features found in the V-Max that made their debut in the Provari. Smoktech has created their own take on these features, though, packages them in a slightly different form and offers it at a lower price. Clone, no, evolution, yes. The most striking thing about the design of the VMax is that it looks and feels relatively sleek compared to many other advanced personal vaporizers (APV). At 21mm in diameter, it falls somewhere in between the majority of 18350/500/650 mods and thinner models designed around the 14500 battery. The 118mm long tube is made of painted brass and is just wide enough to accommodate the two 18350 batteries that power it. 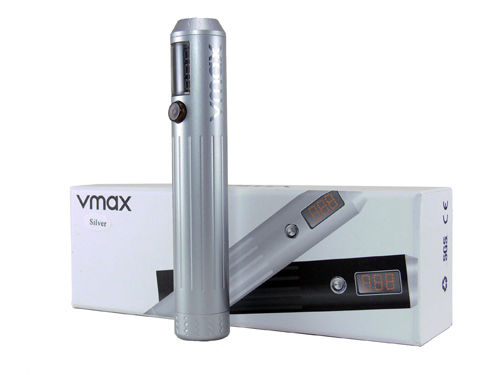 The VMax weighs in at only 4.5oz with batteries installed, which puts it in the middle of the pack for an electronic cigarette with these features. 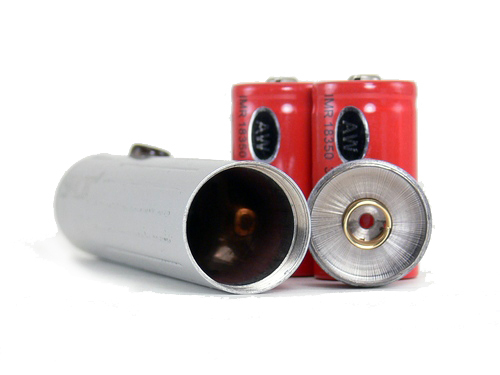 The bottom of the tube unscrews to provide access to the batteries. 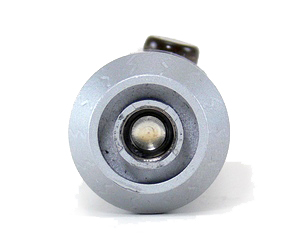 A heavy spring in the cap keeps everything securely positioned and there is a vent hole in the middle for safety. Changing the batteries resets the voltage back to 3.0v and it would be nice if the voltage setting was retained. The atomizer connection is recessed into the top of the device, making it perfectly compatible with tanks. A nice well surrounds the atomizer connection to catch drips. Note to Smoketech: we’d love to see eGo compatible outside threads included in this design. The tube is painted with one of the nicest paint jobs we’ve seen on a lower priced electronic cigarette. It’s not flashy, but the clear coat on the finish gives it a nice gloss and should hopefully help its durability. “SMOK” and “vmax” are attractively screen printed on opposing sides. Flutes along the sides and zigzag lines in the top and bottom caps add further detail. Overall the design and finish are quite attractive. 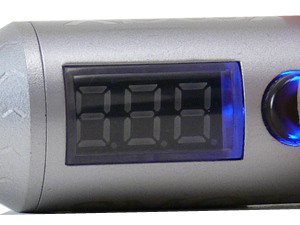 A blue LED illuminates the button and display each time the button is pressed. An LED display features prominently near the top of the device beneath a clear window nicely contoured to match the curve of the tube. Next to the LED is the single button which operates all functions of the VMax. Smoktech has apparently invested some time into the design of the button and it engages easily and does not seem prone to the sticking found in some electronic cigarettes. The LED display and the information presented on it is where the majority of copycat allegations will be leveled at the VMax. Quite simply, it incorporates all of the features found in the Provari, including output voltage adjustment, battery level and atomizer resistance check and power on/off. A series of button presses takes you through the menu where each item is numbered for easy reference. There is a manual included that details all of the settings, but Goodejuice has all the information on the VMax product page for a much easier read. Smoktech improves upon the design by allowing the user to chose what is displayed by the LED each time the electronic cigarette is activated. 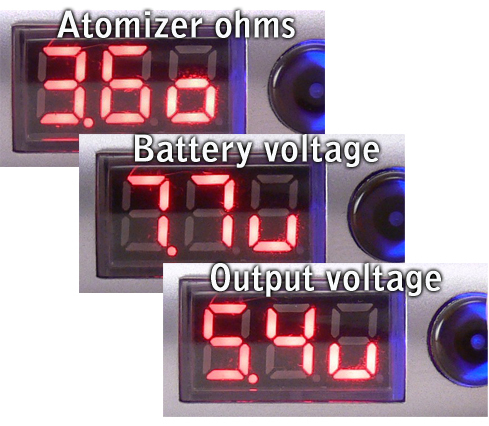 Battery charge, atomizer resistance and output voltage can be selected. The numeric LED display can also be turned off completely if desired, however it appears that the blue LED behind the button cannot. The performance of the VMax is excellent, with one small caveat. The Goodejuice website displays the specifications that Smoktech lists for the device, including a 5amp current limit. That’s right, 5amps. Most variable voltage devices are limited to 2.5amps or less and only the second version of the Provari is capable of 3.5amps. In practice, this means that the VMax can handle even low resistance atomizers at higher voltages where nearly all other devices would either lower the output or stop it altogether. Voltage can be adjusted from 3.0 to 6.0 volts. The caveat is that the output from the VMax is a little difficult to measure and appears to effectively higher than the voltage setting. At issue is the way the microprocessor modulates the voltage. pbusardo does a great job of explaining it in his video, but the gist of it is that the peaks of the modulated voltage waveform of the VMax are considerably higher than the displayed voltage setting, making for a hotter vape. When set at 4 volts, for instance, actual measured output voltage looks like 3.5v but feels more like 4.5v. The 5v setting delivers 4.5v but feels like 5.5v and so on. The net result is that the vape will actually be a lot hotter than another device set at the same voltage. As for my tests, the VMax appeared to deliver 5.3v with a 1.6ohm carto attached, but apparently delivered 6.0v or even more. That carto is now a charred hulk that I certainly wouldn’t want to vape. For the sake of comparison, the Provari stopped working and displayed an error code with the 1.6ohm carto at anything over 4.5v. Here’s the short version of the voltage discussion…the VMax delivers plenty of voltage, but the display may report it a little on the low side. We haven’t had enough time with this device to say for sure, but battery life seems to be about average. There is still life in them after a day’s worth of moderate vaping, which is a reasonable expectation for the 700mAh 18350 cells. One note that must be addressed here is the importance of safety when using stacked batteries. Only protected cells should be used and only in matched pairs, meaning both with the same amount of charge. The VMax has a vent hole in the cap for safety, but proper battery procedure will help to ensure it’s never needed. The folks at Goodejuice were excited to start carrying the VMax, and I can see why. In several respects, this is one of the best variable voltage APVs on the market and may be Smoktech’s best offering yet. Everything functions just as it should and looks good in the process. Although the voltage is a little lower than indicated, it can still deliver enough to really pack a wallop (or fry a carto, for that matter). Everything appears quite solid and barring any quality issues, this will likely become one of the devices that others seek to imitate. Note: Goodejuice is a SUpporting Supplier of Vaping Guides and provided this unit for review. As usual, I try to let neither of these facts interfere with an objective review.